Gestational trophoblastic disease (GTD) constitutes a spectrum of tumors and tumor-like conditions characterized by abnormal proliferation of pregnancy-associated trophoblastic cells of progressive malignant potential. The most adopted pathological classification of GTD is developed by the WHO in 2014 which includes neoplasms – choriocarcinoma (CC), placental site trophoblastic tumor (PSTT), and epithelioid trophoblastic tumor (ETT); nonneoplastic lesions – exaggerated placental site (EPS), placental site nodule (PSN), and plaque; and molar pregnancies – hydatidiform mole (HM) – complete HM (CHM), partial HM (PHM), invasive HM (IHM). HMs occur in 1:600 pregnancies in the United Kingdom, with even higher rates in the Middle East, Latin America, Africa, and the Far East., The majority of molar pregnancies spontaneously regress following suction evacuation; however, 8%–30% of HMs persist after evacuation and develop into gestational trophoblastic neoplasia (GTN) which invade locally and metastasize requiring chemotherapy. Perfect identification and separation of individual subgroups of GTD are important because the clinical presentation, biological behavior, therapeutic management, prognosis, duration, and interval between follow-ups differ for different categories. Furthermore, these disorders mimic growth patterns encountered in early normal placental development, nonmolar hydropic abortions, and many nontrophoblastic lesions. 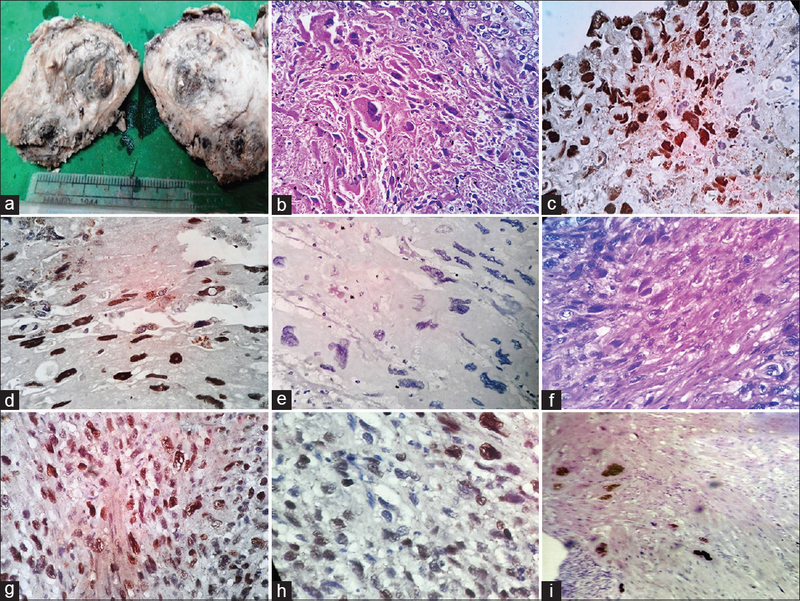 Therefore, definite diagnosis is required not only to differentiate among the individual entities but also to avoid confusion among these trophoblastic lesions with their mimickers, which is difficult, when based only on histopathology. Despite well-described histomorphologic criteria, the distinction of spontaneous abortion from HM and CHM from PHM and IHM, ETT from PSTT, and EST from CC and PSTT remains a problem because of interobserver and intraobserver variability.,, Especially in early pregnancy, the diagnostic criteria are subtly different from the classical pathological features. Trophoblastic proliferation is regulated by interaction between different cell cyclin proteins including cyclin E and its accumulation may play a role in malignant transformation of trophoblasts., Dysregulation of Cyclin E/cyclin-dependent kinase-2 (CDK-2) complex and its inhibitors participated in the development of gestational trophoblastic tumor. The expression of G1/S cell cycle inhibitors correlates well with normal trophoblast differentiation and is markedly altered in the GTDs, including CHM/PHM/IHM and CC. Zhang et al. investigated the expression of p63 isoforms in various trophoblastic diseases and correlated with clinical progress, proliferation, and apoptotic activities. Evaluation of expressions of p63 in the cytotrophoblastic cells helps in reliable discrimination between spontaneous abortions and HM. Ki-67 immunoexpression can help in distinguishing different HMs and CC, but there is differing opinion regarding its expression in various trophoblasts and their distinction. A study of HMs with p57 and molecular genotyping has been validated previously. However, the role of different cell cycle regulatory proteins in all the different entities of GTDs, normal placenta, and hydropic abortus (HA) has not been tried. Therefore, the authors have conducted this study employing immunomarkers such as cyclin-E, Ki-67, and p63 which will act as an adjunct to histopathological study. The present study was conducted in a tertiary care hospital and medical college from September 2013 to June 2017, in the department of pathology and O and G with the approval of an independent ethical committee institutional review board (IEC/IRB No. 177/7.9.15). There were 96 formalin-fixed paraffin-embedded tissue blocks used in this study: 48 were of GTD and 48 controls (without GTD – first-trimester [up to 12 weeks of gestation], second-trimester [up to 24 weeks], and third-trimester [till term] placenta and hydropic abortion). The controls were taken as consecutive samples received by the authors. By normal placenta, it means that all of them were obtained from induced abortion placental tissues of first- and second-trimester (the pregnant women having normal pregnancy who opted for termination) and last-trimester placenta delivered with normal babies. Villous maturation in placentas was as per gestational age without delayed or accelerated maturation. Paraffin blocks which were most representative of pathology were chosen for performing IHC. In this study, an indirect method of IHC was employed, which is a two-step process in which the tissue is treated with an unlabeled primary antibody, followed by application of a chromogen-labeled secondary antibody (directed against the primary antibody). We used normal placenta as positive and negative controls were prepared by omitting the primary antibody. For all the three IHC markers used in this study, homogeneous nuclear staining is considered as positive regardless of staining intensity. Occasional cytoplasmic staining is considered nonspecific and not included in our evaluation. A quantitative scoring system is used for Cyclin E, Ki-67, and p63 basing on the number of trophoblasts having nuclear staining among 100 trophoblastic cells. Scores are recorded as follows: score 0 = no staining, score 1+ = 1%–10%, score 2+ = 11%–25%, score 3+ =26%–50%, and score 4+ = >50%. IHC stain in all cases was evaluated independently by two expert histopathologists, and in case of any discrepancy, the slides were subjected to concurrent review under Penta head microscope by both of them. The results were noted down in tabular form. The Chi-square test or Fisher's test (whichever was applicable depending on the table pattern) was employed to find the correlation and association between desired variables. The result was considered statistically significant if P < 0.05. For statistical analysis, the software used was SPSS version 20.0 (IBM, Armonk, NY). In the present study, there were total 96 cases, including 48 cases of GTD (Group A) and 48 controls (Group B – 40 normal placentas of different trimesters: early – 25, mid-trimester – 7, and late – 8 and 8 HA). Cases included CHM (20 cases), PHM (11 cases), IHM (2 cases), CC (9 cases), PSTT (2 cases), and EPS (4 cases). Most of the cases (54.1%) presented in the third decades of life. Least number of cases, i.e., only 8.33% were above 40 years. Mean age of presentation was 28.25 ± 6.982 years with youngest patient being 18 years old and oldest of 43 years. Majority (29 cases, 60.42%) were between para 1 and 4 and 12 cases (25%) were nullipara. Very high serum beta-human chorionic gonadotropin was detected only in cases of CC (8/9 cases, 88.9%). Complaint of bleeding per vaginum (85.4%) was most common followed by pain abdomen [Table 1]. In normal placenta of all trimesters, Cyclin E differential expression was nearly similar, i.e., score 2+ [Figure 1]a. Ki-67 was high but p63 moderate with score 1+ [Figure 1]b and [Figure 1]c. In case of HA, only 50% showed weak expression of cyclin E, i.e., score of 1+, and other markers (p63 and Ki-67) were found to be zero [Figure 1]d, [Figure 1]e, [Figure 1]f. CHM cases showed stronger IHC score for cyclin E (45% – 3+ and 35% – 4+) in comparison to PHM (81.82% – 2+) [Figure 3]. This was appreciably different when compared with PHM in which maximum number of cases had cyclin E score 2+ (81.82%). Ki-67 in these cases was high (2+), but p63 was found to be low at 1+. Hence, cyclin E and Ki-67 are more in CHM than PHM, normal placenta, and HA [Figure 3]a, [Figure 3]b, [Figure 3]c, [Figure 3]d, [Figure 3]e, [Figure 3]f, [Figure 3]g, [Figure 3]h, [Figure 3]i. IHM showed Cyclin E 3+, p631+, and Ki-67 3+. Maximum number of cases of CC, PSTT, and EPS showed strong positivity for cyclin E with score 4+ [Figure 2] and [Figure 4]. However, whereas Ki-67 is very high (3+) in CC and PSTT, it is zero in EPS. [Table 2] reveals that there was no significant difference in IHC expression for p63 among normal placenta of different trimesters, CHM, and PHM with a weak staining for p63, i.e., 1+. 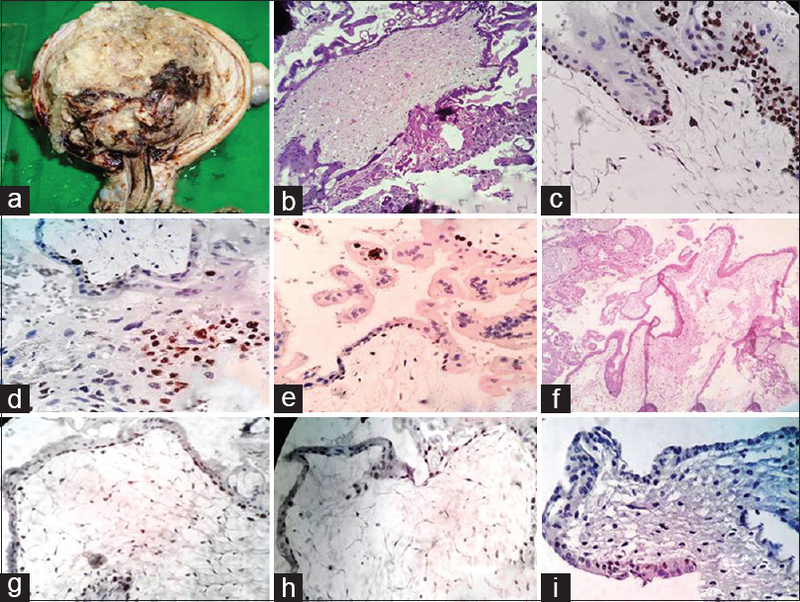 In early placenta, 60% showed 1+ staining, 20% had 2+, and 20% did not take the stain. Five out of nine CC (55.56%) cases showed p63 positivity scoring 2+. None of the cases had score 4+. Early stage of placenta expressed higher level of Ki-67 in comparison to mid- and late-trimester placenta [Figure 1]b. 60% of early trimester placenta had a score of 2+ and 40 had 1+ score. Four cases of mid-stage placenta were included in this study, all had a score of 1+, and among third-trimester placentas, 62.5% did not take the stain. About 25% showed weak staining of 1+ score and 12.5% had score 2+ [Table 3]. Higher levels of Ki-67 immunoreactivity was noted in CHM, IH, and CC. Out of 20 cases of CHM, 6 (30%) cases had score 4+ and 7 (35%) had a score 3+. All cases of IHM had score of 3+. Seven out of nine CC cases (77.78%) had a score of 4+ and rest two cases had 3+ score. In case of PHM, Ki-67 activity is less, i.e. 81.82% of cases showed Ki-67 positivity in only 1%–10% of cells with a score of 1+ and rest of the cases (18.18%) had a score of 2+ which is quite less from what we observed for CHM. PSTT (75% – 3+) had significantly greater Ki-67 positivity than EPS (50% – 1+). [Table 2] shows the comparative analysis of immunohistochemical scoring among cases and controls. IHC scoring difference was found to be statically significant for cyclin E and Ki-67 having P = 0.001 and 0.004, respectively when compared between GTD and control group. However, for p63, there is no significant difference between cases and controls with P = 0.369. Role of Cyclin E has been proved in various human cancers. However, very few studies have documented its role in GTD. Normal progression of cell cycle is regulated by the coordinated interactions of various proteins such as E2F-1, CDKs, and Cyclin E. Cyclin E forms a complex with CDK-2 and controls the G1-S transition by phosphorylation (i.e., inactivation) of retinoblastoma protein, which is an inhibitor of cell cycle progression. Hence, cyclin E promotes cell cycle progression. In this study, cyclin E was uniformly expressed at moderate levels (2+) in 80.76% of normal placentas [Table 3]. Staining was limited to the basal cytotrophoblast nuclei surrounding the villi. The syncytiotrophoblast was mostly negative. Cyclin E overexpression was seen in GTD in comparison to control group (normal placenta and hydropic placenta) with P = 0.001, which is statistically significant. We did not find role of p63 as an ideal marker in differential diagnosis among different GTD. When we compared its staining between GTD and control groups, the P value was found to be 0.369 which is statistically insignificant. In comparison to the control group, GTD cases expressed a higher Ki-67 activity with statistically significant P = 0.004. In addition, according to present results, none of the abortions and partial moles were diffusely labeled with Ki-67 (>50%) which is supported by Erfanian et al. Histologically EPS and PSTT both show infiltration of implantation site intermediate trophoblasts into the myometrium. Both of them showed high Cyclin E score. However, there is a difference in Ki-67 staining among them. Hence, Ki-67 IHC staining is helpful in distinguishing these two entities. We found very low Ki-67 expression in PSN cases, that is, 50% of cases showed 1+ and rest 50% were negative for marker. In this study, most of the patients of GTD (26 cases, 54.17%) were in between 21 and 30 years. This result was comparable to data obtained by Pariyar et al., who reported 51.2% of cases belonging to 21–30 years' age group. Parity distribution among GTD patients revealed that majority (29 cases, 60.42%) were between para 1 and 4. Out of them, higher incidence was seen in para 2 [Table 1]. Riadh et al. reported 52.2% of patients of GTD as paucipara. However, Pariyar et al. reported a higher incidence among primigravid., Bleeding per vaginum was the most common symptom found in 85.40% of cases, in this study. About 62.50% of patients presented with pain abdomen, and passage of grape-like vesicles was seen in 31.25%. These were also demonstrated by Nirmala et al. Our result was supported by a study done by Olvera et al. who also got moderate immunoreactivity in early, mid, and late trimester of normal placenta. Kim et al. researched exclusively on Cyclin E and compared hydropic placentas to GTD and reported overexpression of cyclin E in GTD. Similar to our result, they also found comparatively higher cyclin E levels in CC than in CHM. However, Olvera et al. reported similar levels of cyclin E overexpression in both CHM and CC and got moderate immunoreactivity in early, mid, and late trimester of normal placenta. As in the present study, they found that PHM did not exhibit the same level of cyclin E overexpression as found in CHM and CC. Kim et al. also noted decreased levels in PHM, yet they were not able to demonstrate statistical significance. PSTT and EPS (100% of cases) showed strong positivity for Cyclin E with score 4+, but Ki-67 expression is very high in PSTT but low in EPS. This study revealed p63 staining to be low to moderate in normal placenta [Table 3]. Nonmolar hydropic placenta (66.67%) and most of the molar pregnancy also showed low staining for p63 (score 1+). Among CC, 55.56% of cases showed score 2+ and 22.22% showed score 3+. Ramalho et al. in their study did not find any p63-positive cells in CCs. They concluded that p63 might be useful to differentiate CC from other GTD and might have a role in malignant transformation of GTDs. However, at present, we noted that 8 out of 9 (88.89%) cases of CC showed weak-to-moderate staining for p63. This observation was comparable with Zhang et al., who showed that CCs showed focal p63 positivity (0%–5.62%) and P > 0.05. Erfanian et al. reported that all CCs were positive for p63. According to them, p63 labeling index and distribution of immunostaining are useful in separating CC from HA and PHM mole but not from CHM. Furthermore, they concluded that p63 may be an ideal marker in separating abortion from moles in doubtful cases. However, p63 is an ideal marker to distinguish tumors of chorionic trophoblastic origin, i.e. ETT from PSTT. The difference in the present study from the above authors may be due to the difference in scoring system and the fact that, unlike this study, they not only focus on p63 labeling index, but they also studied distribution and intensity of immunostaining. During the study, it was observed that Ki-67 staining gradually reduces with maturation of placenta. Olvera et al. observed decrease in Ki-67-stained trophoblast proliferation as normal gestation progressed. This finding has been previously reported by many authors, although the study was limited to comparisons of first- and third-trimester placentas. The use of immunomarkers such as Cyclin E, p63, and Ki-67 can help in differentiation between normal and abnormal placenta, hydropic abortion, complete, partial, and invasive moles, and also GTN. In addition, it also gives information about persistence and malignant transformation in various GTDs. Follow-up of all the cases was not feasible in all cases and some of the cases are followed for very short period of time. This innovative and original work includes entities from each category with multiple immunomarkers, where we noted the differential expression of these markers in various subgroups and mimicks of GTD. Cunnigham FG, Leveno KJ, Bloom SL, Hauth JC, Rouse DJ, Spong CY. Gastational Trophoblastic Disease. Williams Obstetrics. 23th ed. New York: McGraw Hill; 2010. p. 257-65.
International Agency for Research on Cancer. WHO Classification of Tumours of Female Reproductive Organs (IARC WHO Classification of Tumours). 4th ed. CHF: International Agency for Research on Cancer; 2014. Savage P, Williams J, Wong SL, Short D, Casalboni S, Catalano K, et al. The demographics of molar pregnancies in England and wales from 2000-2009. J Reprod Med 2010;55:341-5. Shi YF, Li JQ, Zheng W, Chen XJ, Qiao YH, Hao M, et al. Survey of gestational trophoblastic disease incidence among 3.6 million pregnancies in China. Zhonghua Fu Chan Ke Za Zhi 2005;40:76-8. Ngu SF, Chan KK. Management of chemoresistant and quiescent gestational trophoblastic disease. Curr Obstet Gynecol Rep 2014;3:84-90. Shih IE, Mazur MT, Kurman RJ. Gestational trophoblastic disease. In: Mills SE. Sternberg's Diagnostic Surgical Pathology. 5th ed., Vol. 3. Philadelphia: Lippincott Williams & Wilkins; 2010. p. 2049-70. Gupta M, Vang R, Yemelyanova AV, Kurman RJ, Li FR, Maambo EC, et al. 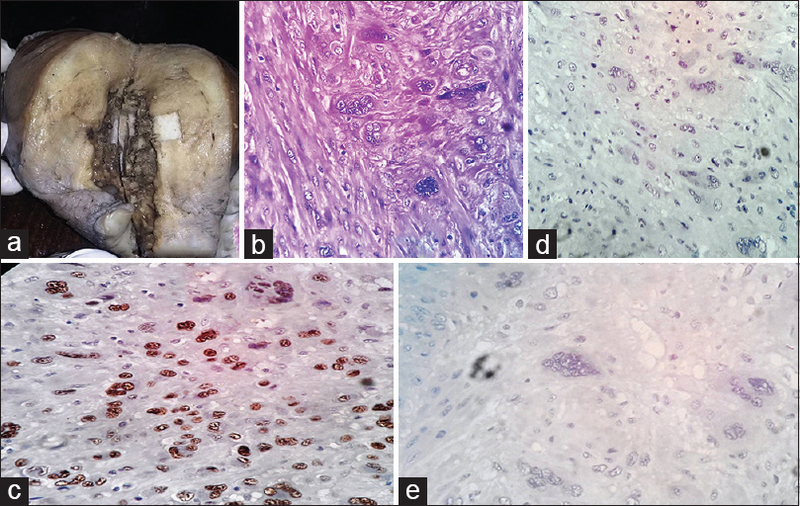 Diagnostic reproducibility of hydatidiform moles: Ancillary techniques (p57 immunohistochemistry and molecular genotyping) improve morphologic diagnosis for both recently trained and experienced gynecologic pathologists. Am J Surg Pathol 2012;36:1747-60. Buza N, Hui P. Gestational trophoblastic disease: Histopathological diagnosis in the molecular era. Diagn Histopathol 2010;10:526-37. Fukunaga M, Katabuchi H, Nagasaka T, Mikami Y, Minamiguchi S, Lage JM, et al. Interobserver and intraobserver variability in the diagnosis of hydatidiform mole. Am J Surg Pathol 2005;29:942-7. Erfanian M, Sharifi N, Omidi AA. P63 and Ki-67 expression in trophoblastic disease and spontaneous abortion. J Res Med Sci 2009;14:375-84. Olvera M, Harris S, Amezcua CA, McCourty A, Rezk S, Koo C, et al. Immunohistochemical expression of cell cycle proteins E2F-1, cdk-2, cyclin E, p27(kip1), and Ki-67 in normal placenta and gestational trophoblastic disease. Mod Pathol 2001;14:1036-42. Kim YT, Cho NH, Ko JH, Yang WI, Kim JW, Choi EK, et al. 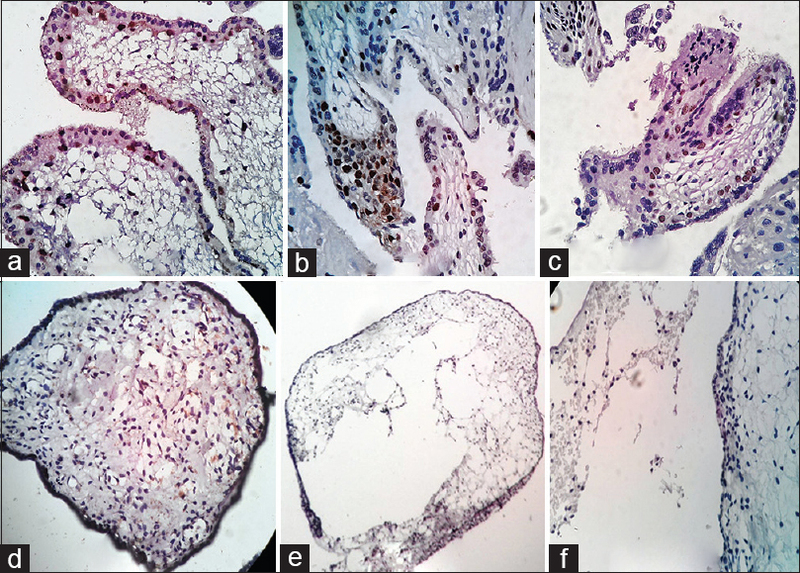 Expression of cyclin E in placentas with hydropic change and gestational trophoblastic diseases: Implications for the malignant transformation of trophoblasts. Cancer 2000;89:673-9. Li N, Peng-Peng QU. Expression of cyclin E and its related proteins in gestational trophoblastic disease. J Int Obstet Gynecol 2014;41:324-26. Xuan YH, Kim KH, Choi YL, Ahn G, Chae SW, Lee H, et al. The expression of G1-S cell cycle inhibitors in normal placenta and gestational trophoblastic diseases. Korean J Pathol 2008;42:67-74. Zhang HJ, Xue WC, Siu MK, Liao XY, Ngan HY, Cheung AN. P63 expression in gestational trophoblastic disease: Correlation with proliferation and apoptotic dynamics. Int J Gynecol Pathol 2009;28:172-8. Lolli G, Johnson LN. CAK-cyclin-dependent activating kinase: A key kinase in cell cycle control and a target for drugs? Cell Cycle 2005;4:572-7. Pariyar J, Shrestha B, Shrestha J, Rauniyar BP, Regmi SC. Gestational trophoblastic disease: Review of cases managed at B P Koirala memorial cancer hospital. Nepal J Obstet Gynaecol 2013;8:18-21. Riadh BT, Abdellatif C, Wissal H, Leila A, Taher M, Abdelhamid K, et al. Clinical analysis and management of gestational trophoblastic diseases: A 90 cases study. Int J Biomed Sci 2009;5:321-5. Nirmala CK, Nor Azlin MI, Harry SR, Lim PS, Shafiee MN, Nur Azurah AG, et al. Outcome of molar pregnancies in Malaysia: A tertiary centre experience. J Obstet Gynaecol 2013;33:191-3. Ramalho LN, Maggiori MS, Ribeiro-Silva A, Peres LC. P63 expression in hydropic abortion and gestational trophoblastic diseases. Placenta 2006;27:740-3. Xue WC, Khoo US, Ngan HY, Chan KY, Chiu PM, Tsao SW, et al. Minichromosome maintenance protein 7 expression in gestational trophoblastic disease: Correlation with Ki67, PCNA and clinicopathological parameters. Histopathology 2003;43:485-90. Khooei A, Atabaki Pasdar F, Fazel A, Mahmoudi M, Nikravesh MR, Khaje Delui M, et al. Ki-67 expression in hydatidiform moles and hydropic abortions. Iran Red Crescent Med J 2013;15:590-4. Kale A, Söylemez F, Ensari A. Expressions of proliferation markers (Ki-67, proliferating cell nuclear antigen, and silver-staining nucleolar organizer regions) and of p53 tumor protein in gestational trophoblastic disease. Am J Obstet Gynecol 2001;184:567-74. Scholzen T, Gerdes J. The Ki-67 protein: From the known and the unknown. J Cell Physiol 2000;182:311-22. Mahzouni P, Mokhtari M, Amirmansour B. Diffrentiation between reactive gliosis and astrocytomas by MIB-1/Ki67 immunostaining. J Res Med Sci 2007;12:241-5.